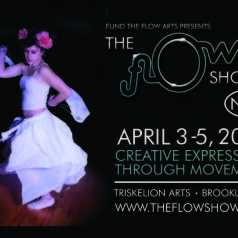 Fund The Flow Arts presents the 3rd annual Flow Show NYC at The Muriel Schulman Theater, a brand new location for Triskelion Arts. The Flow Show NYC features talented artists from The Big Apple and beyond. The Flow Show highlights innovative movement arts combining prop manipulation with dance, juggling and theater. This year’s performance props include Poi, Hoops, Fans, Staff,Contact Balls and Diabolo. Come check us out and make sure to get tickets soon as they have sold out every year!